Okay, true, Titan is off-topic here but still I can't pass up an opportunity to mention a paper that was published today in Geophysical Research Letters (in which I am second author of) reporting the discovery of active playa in the south polar region of Saturn's moon Titan. We also released a press release on this. While counting and measuring dark features in the south polar region last year in preparation for a Titan paper, I found that some of these features were in one observation from June 2005 but not in the other from July 2004. If these were small features, I could discount them as being due to resolution effects and the effects of the atmosphere that blurs out details, but these changes were much too large. You can see what I am talking about on the Planetary Photojournal. It didn't take us long to figure out what we were looking at, a real surface change on the surface. We surmise that this change resulted from a rainstorm that dumped enough rain over this spot on Titan to flood the valley floors with a shallow layer of liquid methane. The most likely storm (that we are aware of, keep in mind that we don't have continuous coverage) to have caused this was a massive storm system seen from Earth and by Cassini ISS in early October 2004. The brightest part of the storm (and plausibly the most intense part of the storm with the greatest cloud heights) was located over this surface change in the ISS observation of the storm on October 8, 2004. Anyways, even though it was off-topic, I thought I would quickly share this here. Van Kane has published on his blog, Future Planetary Exploration, his thoughts on the Outer Planet Flagship mission proposals. Like, it looks like he would fine with either one being selected and shares some of my opinions. For example, one of the reasons I (barely) prefer the Europa Jupiter System Mission is that it seems to do a lot more broad science of the entire Jupiter system, including Europa, whereas the Titan mission focuses primarily on Titan and Enceladus. The Titan mission though has some amazing plans, such as the hot-air balloon and the boat. Yesterday's 365 Days of Astronomy Podcast has a nice overview of Jupiter's Great Red Spot. The Detailed mission studies for the two flagship mission proposals have not been released yet, so stop asking me. There are a few great videos of the annular eclipse the other day. This one is my favorite. 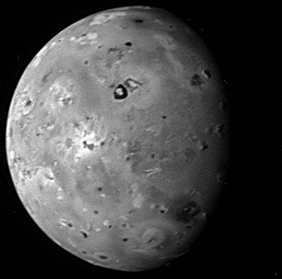 Boösaule Montes was best seen during the 1979 Voyager 1 encounter with Io but it can also be seen in several global views acquired by Galileo and New Horizons. The image at right is part of a mosaic acquired by Voyager 1 and is the highest resolution images of this feature at around 0.9 km/pixel. Boösaule Montes, located just to the northwest of the Pele plume deposit, actually consists of not one, but three separate mountains connected by a raised plain. Each mountain displays a unique morphology. Boösaule Montes "South", seen near the bottom of the image at right, is the tallest mountain on Io. Based on stereo work performed by Paul Schenk et al. 2001, this massif is at least 17.5 kilometers in height. This is more than four kilometers greater than the next tallest mountain on Io, Euboea Montes. The mountain has an irregular morphology, with a relatively gentle slope throughout much of the mountain except for an abrupt scarp on the peak's southeastern margin. According to Schenk et al. 2001, this scarp has a height of approximately 15 km and a slope of 40°. Such a sharp scarp would suggest that a landslide transported some of the mountain's material downslope, but unlike most landslides on Io, the material doesn't seem to have been transported very far from the mountain. Instead, a textured deposit ~3-5 km thick can be seen at the base of the scarp. Based on this morphology, Schenk et al. interprets this sharp slope as a slump scarp. The mountain is surrounded by a broad plateau that likely represent mass-wasted material, but again, this is oddly absent on the mountain's southwestern margin. On potential sink for material seen at other mountains on Io, paterae, is absent from the immediate surroundings of Boösaule Montes "South". However, to the southwest of Boösaule "South", an old lava flow follows the basal scarp of the mountain. The flow originates from the southern end of a patera (seen at center left in the above image) to the northwest of Boösaule "South". I'm not sure if that's why there is no long-runout landslide deposit in that direction. Boösaule Montes "North", seen above center in the image at top, is an 8.5-km-tall, dome-shaped mountain with a large fracture running north-south through it. This type of morphology is akin to lava domes on Earth. One possible formation mechanism for this feature is that this mountain sits atop a diapir, created from rising magma in Io's lithosphere. A plateau, perhaps formed by landslide debris, can be seen between both mountains. The last component, Boösaule Montes "East", seen near upper right in the image at top, is a 7-km tall plateau with two mophologic sections. The western part has a rugged surface with several lineaments running down the length of the mountain. Evidence for mass wasting can be seen along this sections southwestern margin. The eastern part of this mountain has a lower elevation and has a plateau-like morphology. Parts of this plateau have a scalloped margin, suggestive of sapping. Such activity would suggest the presence of sulfur dioxide within some of the layers in the mountain. Coming up later this week, I will address Io's mountains more generally by looking at some features many of these mountains have in common. The Outer Planet Flagship Mission Joint Summary Reports were finally made available to the public. 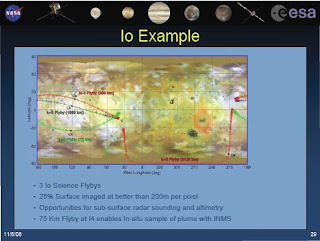 providing us with a chance to look at the final details of the Europa Jupiter System Mission and to examine possible science opportunites at Io during the mission. The downselection between the two Flagship targets, Europa and Titan, has been delayed to February 12. In the run-up to the downselection, a number of organizations are voicing their opinion on which mission should be selected. Nature and Van Kane sided with Titan; I sided with Europa. A new paper was released covering modeling of Io's atmospheric collapse and recovery during and after an eclipse, respectively. I made a neat looking cartoon, if I say so myself. I wrote a length post on the Juno mission and the potential for Io science from that forthcoming mission. This coming week, hopefully the more detailed reports covering the Jupiter Europa Orbiter and the Jupiter Ganymede Orbiter will be released. Also look for a nice post covering Io's tallest mountain, Boosaule Montes. Published today in the journal Icarus's Articles in Press page is a new article by Chris Moore, D. B. Goldstein, P.L. Varghese, L.M. Trafton, and B. Stewart titled, "1-D DSMC Simulation of Io's Atmospheric Collapse and Reformation During and After Eclipse." Note that this article requires a personal or institutional subscription to access. The article presents a computer model of Io's atmosphere during an eclipse of the Sun by Jupiter and how non-condensable chemical species in the atmosphere effect gas number densities and collapse times. Io's thin atmosphere is primarily composed of Sulfur dioxide (SO2), a chemical that also dominates Io's volcanic gases and great gray-white snow fields. The atmosphere of Io is basically in equilibrium vapor pressure with the surface. In other words, the colder the surface temperature, the more SO2 that is condensed out on the surface. The warmer the surface temperature, the more SO2 that sublimates into the atmosphere. In addition to SO2, Sulfur monoxide (SO) and molecular oxygen, disassociative products of SO2, are also present in the atmosphere at much smaller mole fractions. The sudden onset of eclipse for the sub-Jupiter hemisphere brings dramatic surface temperature changes and with it atmospheric changes. Before an eclipse, the molecules (within one scale height of the surface, or 10 km) are well mixed with about 80% SO2 and 20% non-condensable species like SO and O2. Above 10 km, the molecules are not collisional and therefore have different scale heights depending on molecular weight. 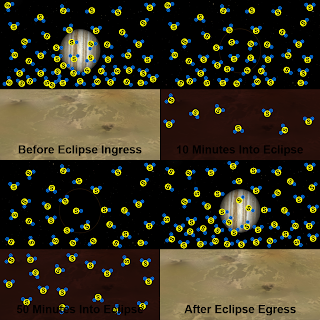 The general picture of what happens during an eclipse, as modeled by Moore et al. can be seen in the cartoon at left. As the eclipse begins, a significant amount of the SO2 in Io's lower atmosphere condenses onto the surface as the surface cools rapidly from 120K at the sub-solar point to ~105-110 K. SO2 in the upper atmosphere does not condense out because of the lag time for the upper atmosphere to sense the temperature change at the surface. This lag is further complicated by energy supplied by the plasma torus which keeps the upper atmosphere's temperature "artificially" inflated. As the eclipse progresses, more SO2 condenses out, but the rate slows as more plasma from the torus reaches the surface, keeping the temperature of the SO2 in the lower atmosphere inflated above what it normally would be if it were in perfect vapor pressure equilibrium. In addition, SO, enhanced in mole fraction as much of the SO2 in the lower atmosphere has condensed into a frost on the surface, forms a diffusion layer near the surface, preventing SO2 higher up in the atmosphere from condensing out. After the eclipse, the SO2 frost that had condense during the eclipse starts to sublimate. This vertical motion in the atmosphere pushes the diffusion layer SO higher up in the atmosphere. Within 30 minutes of the end of the eclipse, the lower atmosphere consists primarily of SO2 while the upper atmosphere is composed of 70% SO2 and 30% SO. Over the next half day, the atmosphere re-equlibrates back to the situation prior to the eclipse. While the surface goes through a similar rapid drop in temperature at sunset, the greater length of night and lateral winds mean that the non-condensable species don't have the same effect as they do during an eclipse. These changes in the atmosphere effect Io's auroral emission, seen in color by Galileo in 1998 (picture shown at top). Most of the auroral emission comes from the upper atmosphere. The fact that upper atmosphere does not condense is consistent with Geissler et al. 2001's observation that the auroral glows observed by Galileo do not dim with time elapsed since eclipse ingress. Nature Sides with Titan Mission and Finally, Which Mission Does Jason Support? As I mentioned in the last post, Nature has a news article by Eric Hand on the run-up to the downselection of the destination of the next Outer Planets Flagship Mission. The article provides quotes from the the study teams on the strengths of both mission. Bob Pappalardo points out that the Europan mission design and the technology needed for it have almost a decade of heritage after at least five mission studies. Quoteth Pappalardo, "Are you going to pick the brightly colored horse, or are you going to ask, 'Is that horse ready to run?'" Ralph Lorenz, a member of the Titan study team, disagrees and states that, "With its atmosphere, its hydrological cycle and even its potential for cryovolcanism, Titan would mobilize a much wider scientific community." Nature also has a short editorial covering more of the shortfalls of both mission concepts and finally comes out in favor of one of the missions. Nature cites the lengthy lifecycle of these concepts (if selected, TSSM, from mission start to the end of that mission, will cover half my life to that point) as a major factor in deciding which mission to put its hat in with. 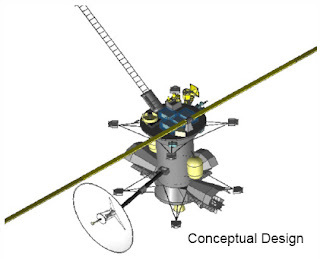 While TSSM takes longer to reach its target, the implied need for a follow-on lander for Europa is seen as a problem for that mission concept. Nature also agreed with some of my criticisms, that the orbital mission doesn't really address the habitability issue as much as the Summary Report would make you think it does. Again, that issue would require a lander (and perhaps a submarine) to more fully answer. According to Nature, the Titan mission is more self-contained as it goes further towards answer the important scientific questions at Titan without necessarily requiring an immediate follow-up mission. So Nature sides with the Titan mission. Okay, so which mission do I support? Well, let me first say, that to be quite honest, I think I will be happy either way. EJSM would examine my favorite world in the Solar System fairly extensively, even if Io isn't the primary target. It would serve as a fine contingency plan in case the Io Volcano Observer is not selected as a Discovery mission. TSSM would more extensively study my second favorite celestial body, Titan. I have friends and colleagues I admire greatly on both study teams. On the basis purely of its study of Io alone, I would favor EJSM being selected. I also feel that EJSM's science would be far less impacted if the mission became NASA-only (because ESA decided not to go with JGO as their Cosmic Visions mission, for example) than TSSM would. Van Kane has a nice post on his blog on a thought experiment on the potential options for the losing side. He states that because of that analysis, he feels that selecting Titan as the target for the next flagship mission as Europa could be studied reasonably with a New Frontiers mission budget, whereas it would be impossible for a Titan mission to do the same (in his experiment, he presumed, if Europa was selected and Titan lost, that NASA and ESA could pool their funds from a New Frontiers AO and from the funds gained by ESA cancelling JGO, the latter not being a real option). The Outer Planet Flagship Mission down-selection, previously scheduled for January 30 has been delayed until February 12, according to JPL's OPF website. The Evaluation Board meeting, which would make a recommendation to the joint NASA/ESA Decision Board, will still meeting at NASA HQ on January 28. In other news, Nature has an article by Eric Hand on the down-selection process in their January 22 issue. The article is available online. As mentioned in the previous post, the Joint Summary Reports for the two mission concepts vying to be NASA's next Outer Planet Flagship Mission have been publicly released [obviously the most important news story to come out of yesterday]. These reports provide an overview of the science goals and mission design of each mission. More detailed reports for each component of both proposals have not been publicly released, probably because of their greater length and technical detail, it is taking longer to edit the reports to make them safe for public consumption [can't let the terrorists get to Europa first...and blow it up, now can we? Wait, is that an option? ;-)] So while it is "only" the summary, there are still a lot of interesting nuggets to be gleaned. Also note that because this is an Io-centric blog, I will only post a summary of the Europa Jupiter System Mission (henceforth EJSM). As another reminder, down-selection is planned for next Friday, January 30 at a NASA/ESA Decision Board with a public announcement planned for either February 3 or 4 at ESA's Science Program Committee meeting. Following the nice, purty cover (provided by the incomparable Michael Carroll) and a graphical summary of the summary report, the EJSM summary report is divided into nine chapters, three of which I will comment on in this post: Science Goals and Objectives, Mission Concept, and Cost and Schedule. The first major section of the report covers objectives and science goals. Two main goals are cited for EJSM: Determine whether the Jupiter System harbors habitable worlds and Characterize the processes within the Jupiter System. These goals fit within the overall theme of the mission: The emergence of habitable worlds around gas giants. The sub-goals under the first mission goal (let's call it "Habitability" for short) really don't seem to fit the stated goal. The sub-goals, like comparing the exospheres, plasma environment, and magnetospheric interactions of the icy satellites, don't seem to work towards achieving the habitability goal, with the exception for determining surface composition [hey, you never know, they could find organics along the Europan ridges] and identifying sites for future in-situ exploration [which could, you know, ACTUALLY look for life and study possible habitable environments]. All the other sub-goals would fit better under the other primary goal (let's call that one Processes). In short, I feel that the mission planners are unfortunately committing my Cardinal Sin Numero Uno, using astrobiology to sell a non-astrobiology mission. In the next section, Mission Concept, the report covers the two flight components to be flown for this mission -- the NASA-supplied Jupiter Europa Orbiter (JEO) and the ESA-supplied Jupiter Ganymede Orbiter (JGO) -- their model payloads and nominal mission plans. To simplify things, the model payloads for payloads are virtually identical (though with differences in the needs of the instruments on the two spacecraft). These instruments include: a laser altimeter, a radio science experiment (with a Ka-band transponder and ultra-stable oscillator), Ice Penetrating Radar, Visible-IR Spectrometer, an Ultraviolet Spectrometer, an Ion and Neutral Mass Spectrometer (JEO-only), Thermal Instrument, Narrow-Angle Camera (JEO-only), Wide- and Medium-Angle Camera, a Magnetometer, Plasma and Particle Analyzers, and a Sub-millimeter Wave Sounder (JGO-only). The narrow-angle camera on JEO will have an IFOV similar to Galileo's SSI, or about 10 microradians per pixel. This provides for a resolution of 10 meters per pixel at a distance of 1000 km. The report also lists the descope order for Jupiter Europa Orbiter. A few of the higher order priorties would effect Io science if the mission were to be descoped, including the loss of color imaging on the NAC, the mass spectrometer, OpNav Functionality (which would limit flyby altitudes to 500 km and up, though without the Mass spectrometer, closer approaches might be lower priority), and the thermal instrument. Luckily, the loss of the NAC entirely is far down on the list. 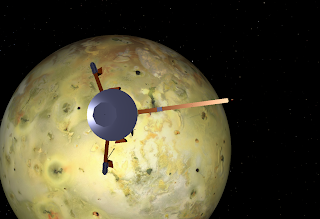 The lack of a narrow-angle camera on JGO as well as the fact that it stays mostly beyond the orbit of Ganymede will likely limit that spacecraft's contribution to Io science with the exception of coordinated observations with JEO and for near-IR observations during the Jupiter System phase of the mission. The mission plan remains similar to what we have heard earlier at OPAG meetings in 2008. Basically, both spacecraft will launch in the First Quarter of 2020 into a Venus-Earth-Earth Gravity Assist trajectory. 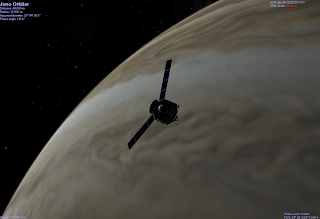 JEO would arrive at Jupiter in December 2025 with an Io flyby (with probably little to no remote sensing) shortly before. JGO would arrive shortly after in February 2026. JEO would then conduct a Jupiter System Science Campaign that would last from JOI until the spacecraft enters Europa orbit in July 2028. The first year of this campaign would include three more Io flybys to be conducted in the second half of 2026. One of these flybys could have a close approach distance of 75 km for mass spectrometer measurements of a plume (though that would require specfic targeting, which would go against the otherwise opportunistic nature of the targeting of these satellite flybys). 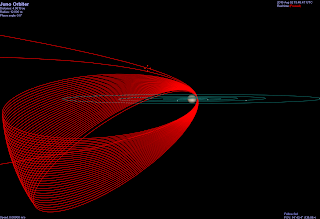 JGO would conduct significant Callisto science (with 19 flybys while that spacecraft is in a resonant orbit) during 2027 before going into orbit around Ganymede in May 2028. Following these spacecraft's orbital missions, they would be crashed into their respective icy satellites. The Summary report only briefly covers the cost of this mission. JEO's full lifecycle cost is expected to be $3.8 Billion in inflation-adjusted costs. JGO's cost is not reported (apparently, it's classified, though the planners expect it to stay below the 650 Million Euro cost cap (that includes all costs, like the launcher). The Joint Summary Reports for both Flagship Mission proposals -- Europa/Jupiter System Mission and Titan/Saturn System Mission -- are now online for everyone to peruse. These reports provide an overview for the NASA and ESA components for both projects. I will be reading the EJSM report this evening and posting an overview in a couple hours. In the mean time, you all can go ahead a take a look at them yourselves. These reports were submitted to NASA by the project teams in early November. Down-selection will occur at a NASA/ESA decision board next Friday, January 30 and should be announced publicly at ESA's Science Program Committee meeting set to take place February 3-4. Today I thought I would write a post on Io's class of giant, volcanic plumes. These shield-shaped clouds of gas and dust are generated at sites of vigorous volcanic activity reaching upwards of 500 km above Io's surface. These plumes are one of two basic classes of volcanic debris clouds observed at Io. The smaller, Prometheus-type plumes are generated as lava flows burn off volatiles such sulfur dioxide. While Prometheus-type plumes are comparatively common, Three volcanoes have had observed giant plumes: Pele, Tvashtar Paterae, and Grian Patera. 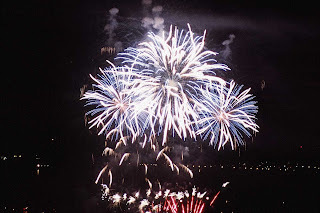 These three plumes share a number of characteristics. The first obviously is their large size. They reach altitudes in excess of 350 km above the surface and can even reach altitudes as high as 500 km. The observed plumes are generally 1100 km in width, or 550 km from the source vent. Secondly, these plumes rarely exhibit a central column, like Prometheus-type plumes. So the plumes appear more like a shield, rather than an umbrella. In Spencer et al. 2007, this difference in shape was interpreted as being caused by different sources for the particulates in these plumes. In Prometheus-type plumes, the dust is ejected along with the gas from the source vent(s). In giant plumes, the dust is condensed from the gas when it reaches the shock canopy, the point when the ejected material stops ascending and begins to fall back to the surface. As you can seen in the movie above of Tvashtar's plume, this dust can form large clumps, likely due to static electricity (resulting from the Io-Jupiter flux tube). High-resolution images of Pele's plume from Voyager also show these clumps at that site. The amount of condensed dust is generally a function of the amount of gas in the plume, which can vary. Less dense plumes, like Pele and Grian, can make these plumes appear quite faint at visible wavelengths, to the point where the plume is considered stealthy. Observations at high phase angles or at ultraviolet wavelengths enhance our ability to see these types of plumes. A third characteristic of these plumes is their sulfur-enriched composition. These plumes have much higher S2 contents compared to Prometheus-type plumes, whose gaseous composition is almost entirely sulfur dioxide. Spencer et al. 2000 showed that the plume at Pele is composed of about seven parts SO2 and one part S2. However, the S2 to SO2 ratio can vary at these plumes from between 0.01 to 0.3. Tvashtar in 2007, for example, had a ratio closer to 0.01-0.02. Giant plumes are often associated with outburst volcanic eruptions. These eruptions have vigorous outpourings of lava and usually have a large lava fountain or curtain at the vent. Giant plumes are thought to form from gas dissolved from these lava fountains. This was particularly the case for Tvashtar in 2000 and 2007 and at Grian in 1999. Pele is an exception to this, however. The source for Pele's plume is a vigorously overturning lava lake. The lava crust is broken up in a number of places at any given time and gas is dissolved from the lava from these cracks. 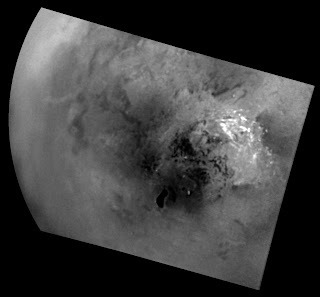 A final characteristic of Io's giant plumes is the large, red plume deposits they form. Unlike the deposits surrounding Prometheus-type plumes, these giant red rings are often oval in shape, with greater north-south radii. The plume deposit from Grian Patera can be seen as a red-orange ring near the limb in the image at right from near the tail end of that eruption. Their distinctive appearance also allows scientists to identify additional giant plume sites even if the plume itself was not observed. This includes Aten Patera and Surt by Voyager 2 in 1979 and Dazhbog Patera, Surt, and a deposit near 70 North, 55 West by Galileo. A factor in the small number of detection is their transience (though again, because of the difference in eruption style, Pele is the exception). The deposit at Grian is a perfect example. The 1999 eruption of Grian Patera began shortly after June 8 of that year (as reported in Howell et al. 2001). It reached a peak brightness on June 22 and was observed by Galileo both in daylight and in eclipse on July 3. It was during these observations that Galileo observed a hotspot at Grian, as well as a giant plume and a red ring deposit surrounding Grian. A dark deposit also surrounded the source patera. During the next perijove in mid-August, the deposit had faded completely as the S2 in the deposit had recombined into the more stable, S8 form of sulfur. I hope you all enjoyed this little discussion of giant plumes on Io. I should probably write more blog posts like this. I have started creating a series of maps to be posted on my Io Images Page for each Galileo orbit. These maps can be used to look at changes that occurred on Io during that mission. Each map is in simple cylindrical projection centered at 180 deg. West longitude. The first map I've created is for C9 and contains images acquired by Galileo's SSI camera in mid-September 1997. 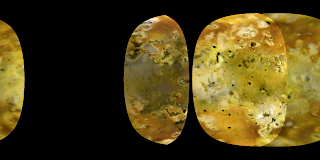 The map contains three images that cover Io's leading and anti-Jupiter hemispheres. While I used photometric correction procedures to flatten the images (reducing the effects of lighting angles), brightness differences are apparent between images due to the odd photometric properties of Io's surface, particularly areas coated with coarse grained sulfur dioxide frost or ice (see my post from last week detailing research into the distribution of this frost on Io's surface). Because this work requires a bit more attention then some of the reprocessing work I did last spring, don't expect this stuff to be posted quickly, maybe 1 or 2 maps per week, though this week I may get out a few more since I will focus on orbits with three or fewer images to use. At the end of this project, I may tie up these maps into some kind of product, maybe an animated gif and a photoshop project. Quick note: I've gone ahead and added the G2 map. This was nice and quick since there was only one color observation that orbit. This map has a resolution of 4.9 km/pixel. In fact, most of these maps will have a resolution to match the top resolution to match the best resolution for that orbit (with a max of 1 km/pixel). I also want to point out that I am trimming each observation so that the max emission angle (angle from nadir) is 75 degrees and the max incidence angle (solar angle; 0 degrees is the sub-solar point; 90 degrees is at the terminator) is 80 degrees. So coverage at the poles for these maps will be quite limited. Today's installment of the 365 Days of Astronomy Podcast provides an interesting narrative of Galileo's discovery of Jupiter's Galilean satellites. Davin Flateau, writer for the blog The Perfect Silence, "gives life" to the fateful days of January 1610, when Galileo Galilei first observed four new worlds revolving around the Solar System's largest planet, a discovery that would have profound effect on the science of Astronomy. In other news, my own installment of the 365 Days of Astronomy Podcast has been scheduled for May 2. 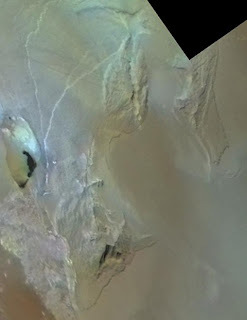 A new Io-related paper was posted online on the journal Icarus's Article-in-Press page, "The global distribution of Sulfur Dioxide ice on Io, observed with OSIRIS on the W.M. Keck telescope" by Conor Laver and Imke de Pater. This paper covers K-band (1.97-2.38 μm), high-spatial and spectral resolution observations of Io's leading and trailing hemisphere acquired by the OSIRIS near-infrared spectrometer at Mauna Kea's Keck II telescope. This is the third in a series of papers by Laver and de Pater based on observations acquired in April and June 2006. The first paper, published in Icarus in 2007, covered an outburst eruption at Tvashtar Patera in April 2006. The second paper, published in Icarus in 2008, covered observations acquired in April 2006 of SO2 frost distribution across Io's leading hemisphere. In their most recent paper, Laver and de Pater explore data acquired on June 1 and 2, 2006 to look at SO2 frost/ice distribution across the leading and trailing hemisphere of Io. In particular, they look at two weak SO2 absorption bands at 1.981 μm (3ν1 + ν3 vibrational mode) and 2.126 μm (ν1 + 3ν3). In addition to including coverage over the trailing hemisphere, the data from June have a higher spatial resolution (65 km at Io's equator) than the April data that was the subject of last year's paper. 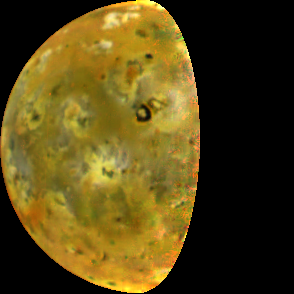 Like the NIMS and VIMS instruments on Galileo and Cassini, respectively, the OSIRIS instrument produces a reflectance spectrum for each of the nearly 2000 pixels that cover the disk of Io. From these reflectance spectra and following some calibration procedures described in the paper, the authors calculated the equivalent width (a method of both measuring the strength of an absorption band and normalizing it to the surrounding continuum) and the Full-width at half-maxium (FWHM; basically the wavelength width of the absorption band in nanometers) for each of the two absorption bands. Based on these calculations, the authors can then measure the fractional coverage of SO2 for each pixel in their map based on the equivalent width and a lower-limit grain size of 700 μm. 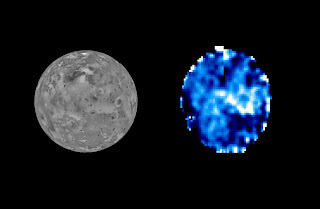 Theoretically, differences in the FWHM can be used the look at differences in grain size across Io, but the spectral resolution was not high enough to explore this. Based on the observed FWHM and the depths of these bands, a grain size lower limit of 700 μm was determined. The authors found an enhancement of SO2 frost within Io's bright equatorial regions, such as Bosphorus Regio, Colchis Regio, Tarsus Regio, and Media Regio and a significant deficiency in SO2 frost west and southwest of Pele on Io's trailing hemisphere. The authors compared these results to similar studies conducted using Voyager ISS data (McEwen 1988) and Galileo NIMS data (Carlson et al. 1997 and Douté et al. 2001). The maps created by Laver and de Pater agree fairly well with McEwen and Carlson's weaker band results, but disagree strongly with Douté and Carlson's stronger band results. The differences observed are likely due to the latter maps showing the distribution of small grained SO2 while the results from weaker bands, like those observed by Laver and de Pater, are sensitive to larger grained ice. The maps by Douté, for example, show higher concentrations of small-grained SO2 at mid-latitudes, particularly north and south of Pele. Laver and de Pater theorize that this difference in the distribution of small- and large-grained SO2 frost results from frost grains annealing in the warmer, equatorial regions (similar to aging snowfields on Earth, just imagine the difference between walking on freshly fallen snow and snow that's been on the ground for a few days, though some of that is due to shrinking pore space between ice grains and diurnal freeze/thaw cycles). At mid-latitudes, frost grains are cooler, and don't anneal to the degree they do at the equator. Overall, an interesting paper that was quite easy to follow, despite being a spectroscopy paper ;) The authors hope to acquire additional observations of these regions to improve the signal-to-noise ratio of their maps. Happy Io Discovery Day to one and all!! On this date in 1610, Galileo Galilei took a look at Jupiter through his new telescope and observed three stars near the giant planet. Over the next few nights, Galileo observed these stars (and found a fourth on January 13) and came to the startling conclusion that these objects were in orbit around Jupiter and were not part of the fixed background of stars, providing another nail in the coffin of the Geocentric world view. Of course, Galileo isn't the only astronomer who claimed to have discovered the Galilean Satellites. Simon Marius, a German astronomer, claimed at the time to have observed them in December 1609. Because Galileo published first, Galileo is now generally regarded as the discoverer, but Marius' names for the Galilean satellites have stuck: Io, Europa, Ganymede, and Callisto. On the 7th day of January in the present year, 1610, in the first hour of the following night, when I was viewing the constellations of the heavons through a telescope, the planet Jupiter presented itself to my view, and as I had prepared for myself a very excellent instrument, I noticed a circumstance which I had never been able to notice before, namely that three little stars, small but very bright, were near the planet; and although I believed them to belong to a number of the fixed stars, yet they made me somewhat wonder, because they seemed to be arranged exactly in a straight line, parallel to the ecliptic, and to be brighter than the rest of the stars, equal to them in magnitude . . .When on January 8th, led by some fatality, I turned again to look at the same part of the heavens, I found a very different state of things, for there were three little stars all west of Jupiter, and nearer together than on the previous night. Don't forget, only one more year until the 400th anniversary of Io's discovery. With this being the International Year of Astronomy, I thought this would be a good time to do a post on Astronomy on Io. Obviously, there are no astronomers on Io (not yet anyway), but perhaps it would be insightful to take a look at a simulated view of Io's night sky and to explore the wonders one could see with the naked eye and through a telescope if one were on the satellite's surface (assuming one were protected from the elements). 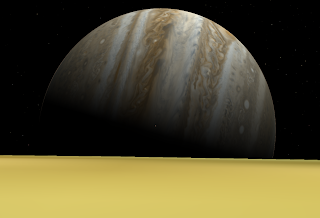 The largest object in our simulated sky is the planet Jupiter, a scant 350,000 km away. 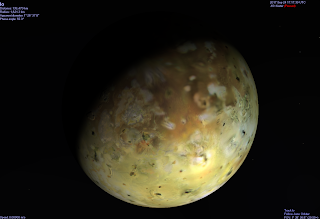 Because Io is tidally locked to Jupiter, much like our own Moon, Jupiter remains motionless in the sky, always resting on the eastern horizons from our observation point at Gish Bar Patera. Jupiter subtends almost 20° in Io's sky, 40 times the size of the Moon in Earth's sky. To give you an idea, an outstretched fist measures about 10° across, so Jupiter would appear 2 fists across. The great size of Jupiter in the sky would make Io an excellent platform to watch Jupiter's cloud formations as Jupiter rotates a little more than four times over the course of an Ionian day. Like our own Moon, Jupiter goes through phases. At Gish Bar, "New Jupiter" occurs at daybreak. In fact, daybreak is delayed by more than an hour because Jupiter eclipses the Sun when the Sun would be rising above the horizons. Also, because of the presence of Jupiter on the eastern horizon, sunrise at Gish Bar would seem remarkably like sunrises on Earth, minus the beautiful colors in the sky. The sun's rays would be refracted through Jupiter's upper atmosphere as the day's eclipses draws to a close, bathing the landscape in reddish light. "First quarter Jupiter" would occur near noon at Gish Bar, "Full Jupiter" would occur just before sunset, and "Third quarter Jupiter" would occur near local midnight. Io's orbit is not a perfect circle, so like our Moon in Earth's sky, Jupiter would very subtly grow and shrink in Io's sky over the course of a day. Currently, Io's closest point in its orbit around Jupiter (called perijove) occurs shortly after sunset at Gish Bar, when Jupiter is just past full phase. 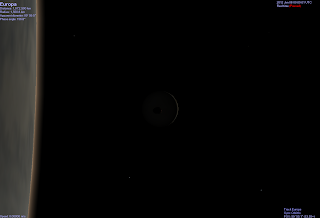 Apojove, when Io is furthest from Jupiter, occurs shortly after sunrise (again, presuming Jupiter weren't there to block the actual sunrise). The difference in distance between perijove and apojove amounts to a 1% difference in the size of Jupiter over the course of an Ionian day. In addition to these size differences, libration over the course of an Ionian day causes Jupiter to appear to rock slightly. This "rocking" is on the order of 4°. Because of the size of Jupiter in the sky, and the brightness of its cloudtops, it would be easier to observe Io's night sky when Jupiter is at a high phase angle, when only a crescent is visible or less, such as during the middle of an eclipse, when the ground would also be dark from the lack of sunlight. While there would be no atmospheric scattering to prevent you from seeing the stars, moons, and planets in the sky, light from the Sun and light reflected from the ground and Jupiter would make it difficult to dark adapt your eyes, making all but the brightest of stars invisible to the naked eye. While Jupiter is known to have at least 63 natural satellites, only eight of these would be visible to the naked eye from Io's surface: Metis, Amalthea, Adrastea, Thebe, Europa, Ganymede, Callisto, and Himalia. Four satellites orbit Jupiter inside the orbit of Io. These moons - Metis, Amalthea, Adrastea, and Thebe - are all much smaller than Io and would appear as bright points of light in the sky. Amalthea, the largest of these inner moons, is big enough that the keenest eyes might be able to see its elongated shape while it transits across Jupiter. Each moon would rise in the east already transiting across the face of Jupiter and would set behind Jupiter several hours later. Because these moons orbit interior to Io, they would never stray very far from Jupiter, only 7° in the case of Metis and Adrastea, 15° for Amalthea, and 20° for Thebe. Europa, the next moon out from Io, is the second largest object in Io's sky when it is closest to Io. From Gish Bar Patera, Europa would appear to rise above Jupiter shortly after perijove and would set one Ionian day later. At its furthest - just after conjunction and it rises above Jupiter - Europa is more than 1.075 million km away from Io and is only 10 arcminutes across in the sky, one-third the size of the Moon in Earth's sky. At its closest - at opposition before setting - Europa is only 256,000 km away and is 41.5 arcminutes across, one-third larger than the Moon in Earth's sky. Currently, Europa rises and sets shortly after sunset, though this shifts in time over the course of a Jovian year. Currently, Europa appears as a very thin crescent when it is at its largest but in three years, Europa will be nearly full at opposition. For the most part, from Gish Bar, the sub-Jovian hemisphere would be seen, though a bit of the anti-Jovian hemisphere (such as the ray crater Pwyll) would be visible when Europa was high in the sky. Ganymede is the next largest object in Io's sky when it is closest to Io. From Gish Bar Patera, Ganymede would appear to rise above Jupiter and sets about 26 hours later. Because of the 4:1 resonance between their orbits, Ganymede rises and sets to a fairly predictable pattern. For example, on January 6 at 12:15 UTC, Ganymede will rise from behind Jupiter shortly after Io has reached the closest point in its orbit to Jupiter. At this point, Ganymede is 1.478 million km from Io and is 12 arcminutes across in Io's sky, about 2.5 times smaller than our Moon in Earth's sky. This occurs shortly after sunset on Io and Ganymede is just past full. Ganymede sets 26 hours later nearing half phase during the late morning hours at Gish Bar. The largest satellite in the solar system would be 644,000 km away and would appear 28 arcminutes across, slightly smaller than the Moon in Earth's sky. 28 hours later, a crescent Ganymede rises above Jupiter, and 26 hours later, at Io's perijove, a thin crescent Ganymede sets shortly after sunset. Another 30 hours later, on Jan. 11 at 05:09 UTC, a half-phase Ganymede rises above Jupiter shortly before noon and 26 hours later Ganymede sets a little past half phase. 30 hours later, on Jan. 13 at 13:30 UTC and a full Ganymede after it began, the cycle repeats as a nearly full Ganymede rises above Jupiter. Interestingly enough, 20 minutes later, an Ionian observer would be able to watch Ganymede's north polar region darken as it experiences a total solar eclipse by Europa. Callisto, the furthest of the Galilean satellites from Jupiter, doesn't display such regular cycles as Ganymede and Europa as Callisto is not in an orbital resonance with Io. Callisto rises above Jupiter at a distance of 2.309 million km from Io and would appear 7.2 arcminutes across in Io's sky, about a quarter of the size of the Moon in Earth's sky. Callisto sets a little more than 22 hours later near opposition when Callisto is 1.472 million km from Io and is 11.2 arcseconds across, or about 3/8ths the size of the Moon in Earth's sky. Among the features that would be targets of interest for an Ionian observer would be the Valhalla impact basin on the western limb and the bright palimpsets Lofn and Heimdall on Callisto's south polar region. 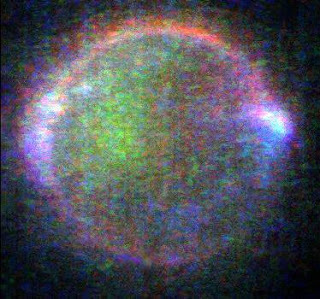 Himalia, the largest of Jupiter's outer irregular satellites, would appear as a barely visible "star" near 5.5 mag. at its brightest. Jupiter's other irregular satellites, would be telescopic targets too faint to be visible to the naked eye. From Io, five additional planets would be visible to the naked eye most times of the year, with Uranus a naked eye target during opposition with that planet. Like Venus and Mercury from Earth, the terrestrial planets would stick fairly close to the Sun, with Mars appears as far as 17° from the Sun. The sun itself would appear much smaller than it does from Earth, only 6.5 arcminutes across, compared to 30 arcminutes from Earth.